I love recipes! Especially baking ones. So when I saw this little blog train asking for volunteers I thought why not! 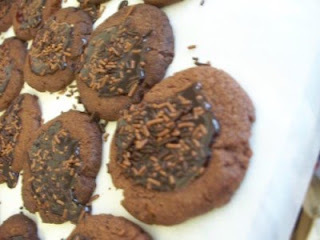 So me and some lovely ladies are gonna share some cookie recipes, check out Lois' blog for a full list of all the ladies taking part– perfect for this time of year. Make a batch as gifts, or take them into work or school to spread a little Christmas cheer. 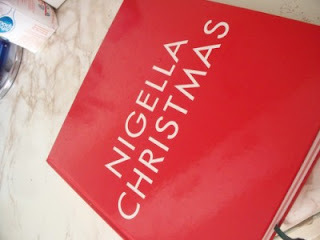 I bought this book last Christmas and baked these cookies – they went down so well, over the Christmas period I baked 3 batches! The recipe states you can make 24 biscuits – but I must make mine a little smaller because I end up with tons – which is a good thing! Preheat the oven to 170c/gas mark 3. 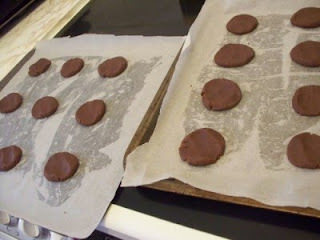 Line your baking trays – I use non stick grease proof paper. 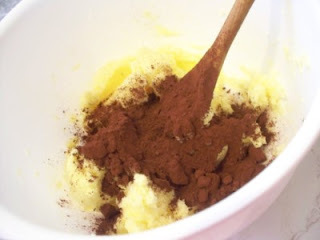 Cream the butter and sugar together, once combined add in the cocoa powder and mix. Then add the flour, bicarb and baking powder. I use a electric mixer to get most of combined. It will look a bit dry – almost like breadcrumbs. Once like this use your hands to combine into a dough. As the mixture is quite sticky, I wear latex gloves to pull of small parts of the dough (size of a walnut) roll in my hands, then squish out on the baking tray. Bake them for about 10-12 minutes – they will feel soft to touch when you take them out. Leave to cool – then you can ice and decorate. Put all the ingredients in a small saucepan and heat on a low heat and whisk until all combined. Leave the icing to cool for about 10 minutes. Spoon the icing onto the biscuits – I lay out a length of baking paper and spread the cookies out on this. I ice and decorate on this. Put the icing on about 6-8 biscuits then put sprinkles on otherwise icing can go too hard. That’s it, they really are yummy! Now go check out Marg’s blog for some more yumminess!! I can’t wait to bake some of these other yummy recipes! Those sure look yummy, I can not wait to try them. Chocolate is always a good thing! Will have to try these with my kids. And they're cute, besides! What a great cookie tray, we'll all be able to make by the time we work our way through to the end of the train! TFS! Mmm, looks easy enough even I could manage them! Yummy, yummy cookies.....my heart be still and my waistline bigger! I must try these little beauty's, thank you for sharing Leanne. I love your cards that you made, simple yet so stunning.....what a clever Miss!! These look delicious....I may just have to try some. These look so yummy. I will be trying them. I have the book and haven't yet made them but you have convinced me to do so.